Table VII in "A Description of the Honour of Windesor"
bl.uk > Online Gallery Home	> Online exhibitions	> The unveiling of Britain	> Table VII in "A Description of the Honour of Windesor"
This is the reference table accompanying the map Follie John Park in "A Description of the Honour of Windesor", John Norden's survey of Windsor. 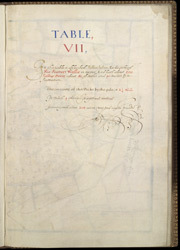 The title page states that the survey was "taken and performed by the perambulation view and delineation of John Norden In Anno 1607". The plans are the result of a survey conducted on foot by Norden. The maps in this volume show communication routes, individual buildings, field boundaries and parkland along with details of wildlife and human activity, such as stags in Windsor Park and people boating on the Thames. The scale at which the maps are presented varies throughout the volume, with feet, perches and miles being the units of measurement recorded by a scale bar. John Norden is best known for his work "Speculum Britainiae", literally a "Mirror of Britain", which in its attempt to include the road names and town plans, lacking on many county maps of the period, was a direct ancestor of the modern A-Z. As well as producing several county maps in the 1590s, Norden worked as a land surveyor producing surveys for landowners and was the author of a work which outlines principles of surveying, known as the "Surveyor's Dialogue".